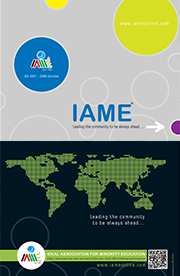 Academic Research and Training ( ART) wing of IAME is a body of subject teachers and academicians, who periodically go through latest innovations in the field of education and training and incorporate them to our curriculum and make appropriate changes in our books. All the suggestions as regard to our text books are scrutinized by ART. The training modules are also prepared by ART.